Last December marked the fifth anniversary of Friends for Dinner in Montreal. I am in awe of how God has used this friendship and hospitality program to mobilize families and churches across the city to share Christ’s love with international students. Because many international students struggle to integrate into the Canadian culture and community, they have few, if any, Canadian friends. Their desire for friendship and meaningful connections with locals has opened a door for Christian families to welcome students into their homes for culture and faith exposure. 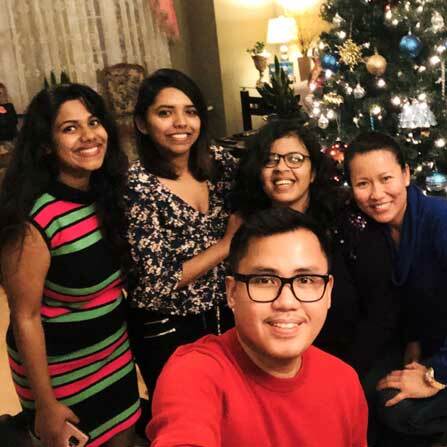 Last December, through Friends for Dinner, 40 students from 15 nationalities with varied religious backgrounds celebrated Christmas with Christian families across Montreal. In addition to delicious meals, some host families shared the Christmas story, sang worship songs, and offered a Bible. We had a terrific time and good conversations about God. We discovered each others’ backgrounds and cultures. After dinner, we played games and prayed. Thank you for this wonderful moment! It was a fun and awesome dinner night! The family is so friendly and they have lovely singing voices! I had one of the best nights in Montreal, so far! We had a wonderful time of experiencing Canadian culture and traditions. Thank you for this opportunity! Thanks to our church partnerships, we have a strong network of Christian families supporting us with their strong friendship and hospitality. For some families, receiving students for dinner is part of their home culture, one that excites their children. What a joy to see entire families ministering together! In 2019, we want to see Friends for Dinner available, not just for major holidays, but throughout the year. Just imagine: students from around the globe regularly visiting Christian families for dinner. And just imagine: seeing these friendships lead students to meet Jesus! Learn more by visiting Friends for Dinner website. *Please note that Friends for Dinner exists in communities other than Montreal.